It’s been a while since we last heard from the Parker Solar Probe, the NASA spacecraft voted most likely to end up as a blistered chunk of molten metal. An update from the space agency suggests it’s now all systems go for the Sun-bound probe, which recently began its second of 24 planned stellar orbits. Parker Solar Probe completed its first orbital journey around the Sun, reaching its aphelion point, that is, it’s farthest orbital distance from our star, on January 19, 2019, reported NASA. It’s once again travelling toward its target, with the probe expected to reach its next perihelion, the closest point to the Sun along its orbital path, on April 4, 2019. The Parker Solar Probe reached this important milestone 161 days into the mission, and it seems everything is going swell so far. The probe is currently transmitting data to Earth using NASA’s Deep Space Network, an array of Earth-based radio antennas and spaced-based devices designed to support spacecraft missions. To date, the probe has transmitted 17 gigabits of precious scientific data back to Earth, said NASA, but it won’t be until April that the entire contents of its first sojourn around the Sun will be received back home. The spacecraft is gathering unprecedented data with its suite of instruments – data that will help scientists learn more about the Sun’s corona, and how stellar material and particles produced by the star move through space at high speeds. Another important milestone came a few weeks before aphelion, when Parker entered into its full operational status, or Phase E, on New Year’s Day. All of the probe’s systems are now online and functioning per specifications, reported NASA. 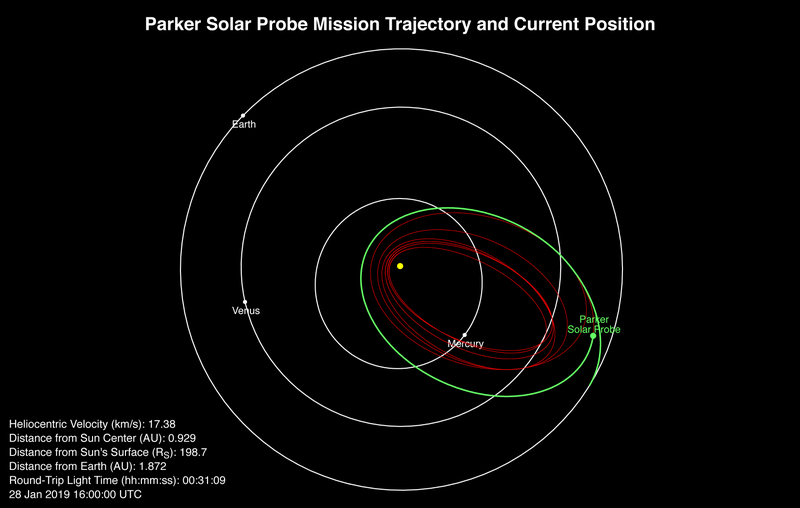 The Parker team can now set their sites on the April perihelion, when the probe will swing by the Sun at a distance of 24.1 million kilometres (15 million miles), which will establish a new record for a human-built object. On October 29, 2018, Parker set the proximity record when it came to within 42.7 million kilometres (26.5 million miles) of the Sun’s surface, shattering the old record held by the Helios 2 probe. The probe’s closest distance is expected in June 2025, at which time it’ll be about 6.16 million kilometres (3.83 million miles) from the Sun. At that proximity, Parker will only require about 88 days to make a complete orbit around the star, and it’ll be travelling at approximately 430,000 miles per hour – fast enough to get from Philadelphia to Washington, D.C., in a single second. In preparation for the April perihelion, mission controllers are making storage space by deleting files already transmitted to Earth and sending updated positional and navigational info, including an automated command sequence that should keep the probe busy for about a month.